18th July 2009, 43 Lancaster Gate, London, W2 3NA. The UN International Day of Families was supported by an enthusiastic, interfaith audience revealing the universal interest and concern for the family. There were presentations on ‘Preparation and Early Support for Family Life’ from Christian, Sikh, Muslim, Hindu, Jain and Unificationists as well as an explanation of the value of Couple Relationship Education by the Chair of the UPF Marriage and Family Committee, Eddie Hartley. The conclusion was presented by the Chair of the Westminster United Nations’ Association, David Wardop, who referred to the United Nations as a world family whose work of quiet diplomacy solves many of the world’s problems. The UN International Day of Families is one that is regularly supported by the UPF worldwide. The event in the UPF HQ is one of several occurring around the UK. In the HOC consultation hand-outs for the consultation held in the House of Commons on 22/04/08 by the Movement for Marriage Dr. Trevor Stammers gave the presentation Marriage and Health on the health benefits of marriage – enlightening! Dr. Alistair Noble gave the presentation Marriage and Education about the education policy concerning education about marriage is schools and the desirability of doing it. Strong Families Around the World by John DeFrain is a valuable article which appeared in Family Matters No.53 Winter 1999 from the Australian Institute of Family Studies and explains that much of the research on families in the 20th Century focused on families in trouble in an effort to answer the question, ‘Why do families fail?’ An alternative approach, focusing on families who are doing well, helps us find answers to the question, ‘How do families succeed?’. It includes the many universal qualities of strong families. - to establish the current status of the current or current prediction for the future relationship. It assesses the couples similarities and also differences in various areas (e.g. communication, conflict resolution, financial managenent, children/parenting, etc.) highlighting strengths and also possible growth areas. It is the possible growth areas which can be strengthened by subsequent programmes and which might endanger the relationship if skills are not improved in these areas. They help make the subsequent programmes followed more targeted and meaningful. 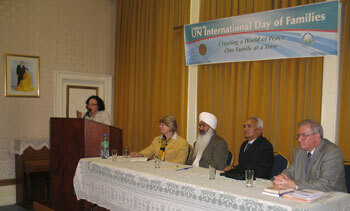 This conference topic and date was arranged and decided with Ambassador for Peace assistance. Due to the MEPI activity the response and the up until the last few days was very limited. However, in the end the result was by the grace of God and according to a number of participants one of the best conferences. The core Ambassadors for Peace established the framework for this conference last November in a meeting in Lord King’s office. It was to focus on inter-generational tensions, the role of women in the family and the experience of intercultural or interracial marriage. The first session featured Dr Raheem Khan, a senior member of the Muslim Council of Britain and the Three Faiths Forum, who spoke of the problems of the current society and contrasted them to his experience within the Asian community where communication was still very strong within the family. He spoke of his inspiration with WAIT, which is a young people’s group that proclaims the message of waiting for the right person and to have a sexual relationship within marriage. Parmy Olson reflected on her family life and those of her friends. ‘It seems to be that young people want to separate from their parents. It would be better if we spend more time together and talk to them as we would a friend. 'My Dad is my best friend and mentor.' Albert Schweitzer stated that parents teach children in three ways, by example, by example and by example. Every generation has a teenage problem even though it seems that this teen generation is the worst. We need to talk to each other more. We need to speak to our parents and elders. Alan Rainer said I have been coming to Lancaster Gate for 30 years and it is always a great pleasure. It is like a family here. My doctoral study is the unity of religions. He saw the unity of each religion to the sacrosanct raising of children in the family. Dr. Carole Ulanowsky, former senior lecturer at the School of Health and Social Welfare at the Open University in Nottingham, spoke on the topic 'Family under strain - a problematic context for motherhood' She perceives motherhood as being two under great sociological pressures: individualism and the undermining of parenting, and especially motherhood, in the early years of a child’s life. These pressures influence Government policy and are reflected in the institutions we have established during the last 30 years as key individuals influenced by post-modernism, have turned their backs on motherhood and created similar structures for others to follow. In response to a question she added that there is an element of self-justification of professional women who abandoned their children and write theories to justify their position. Miss Xiaoming Gao a volunteer youth worker from China, spoke of the wonderful relationship she has with her mother. She has been in the UK for three years. ‘I can feel their love even though they are far away. My mother says to me by phone, 'Dont miss home but try to fly as high as you can. '’ The Mum lives her life for the children and her husband. My Mum is a good listener, cook, cleaner, and friend. Three Ambassador for Peace Awards were presented just prior to lunch. Julie Coker, Lurlene Hoyte-West and Daniel Ulanowsky. Prof. Ian Hall spoke about the difficulties he and Radha had experienced just after marriage as an inter-racial couple. His mother in law had been open-minded during Radha’s childhood but with their marriage she was very hard to relate to. He spoke of the barriers coming down over time until now his mother in law assisted so much with expenses incurred in curing his wife’s cancer. Mr. Saleem Mohammed spoke of the changes in society regarding sexual activity. In the past the youth would try to maintain their purity and integrity. Now he said the youth do not try to maintain their virginity. ‘The ones who are virgins are beat up at school’ he said. It pains me to see mother’s go through so much to bear and raise a child and but these days the children beat her up and are rude to her he added. My parents always educated me to value one partner for life. There are a lot of couples who are beautiful and committed to each other. Among those couples if a love is centred on something beyond themselves, something higher than themselves, it is even more precious. If they love God first then there life can be so exciting. Love just for themselves is not enough but that love should expand beyond the couple and family to the wider world. I am honoured to give the last word. The last word is the most important. We have heard 14 principal speakers from all over the world. It has been amazing how the world has come to hear and appreciate the same message. We can blame the media but why do we continue to receive the media in our homes. We should not allow the media to divide our generations. The base of a happy family is the love of God. If there is a problem then we must improve our relationship with God. There must be a source of love in God. We must replete our container with love so that it might be filled regularly. If the children do not receive love at home then they will look at other sources to receive the love they need. They will look at the television, spend more time with their peer group etc. In the Kingdom of Heaven the family is the original base of True Love. Family has two axis vertical and horizontal planes. Vertical axis is connected to the love of God. The Horizontal plane enjoys the love of God brought to them through the vertical plane of grandparents and parents etc. We cannot only focus on one family but it is an important to change the environment that the families live in. Much of the blame for the present situation falls on the parents. The parents are divine teachers. What we have learned has come to us from Heaven. What we have inherited has to be passed on to continue the inheritance we have received.